Is there a business case for widescale commercial vertical farming in the UK or will it remain a niche opportunity for high-end restaurants and retail? This is the challenge to be discussed by early adopters at the Agri-Tech East conference ‘Innovating for Controlled Environment Agriculture’ on 19 March. Advances in logistics and the falling cost of LED lighting may enable year-round growing of undercover produce in the UK, but will energy costs and technical issues delay scale-up and integration within the food supply chain? “We do think there is the potential for indoor farming to be commercially viable and there are some immediate gains for growing crops such as leafy salads in high hygiene environments,” comments Lindsay Hargreaves, MD of Frederick Hiam, a farming and fresh produce business with farms in Suffolk and Cambridgeshire. “Growing indoors provides greater control of quality and quantity and fewer inputs of plant protection products. There are many approaches to indoor cultivation, such as deep-water hydroponics, vertical soilless cultivation, and aeroponics, where exposed roots are sprayed with nutrients. All of these methods are to be discussed at the conference along with advances in monitoring and robotics. However, despite the news that Sterling Suffolk, one of the UK’s most technically-advanced glasshouses, is set to produce millions of tomatoes starting in February 2019, the cost (£30M) and the technical challenges mean there are few commercial installations in the UK. Also, it is proving difficult to demonstrate to retailers that controlled environment agriculture (CEA) can bring tangible benefits to their supply chain. Kate Hofman, co-founder of GrowUp Farms, which from 2015 to 2017 operated 'Unit 84', a commercial-scale aquaponic urban farm inside an industrial warehouse. The 8,200 square feet of growing space could produce enough for 200,000 salad bags and 4,000kg of fish each year. It sold directly into restaurants, through a New Covent Garden distributor and also through bricks and mortar supermarkets and Farmdrop, the online supermarket. Kate comments: “A key learning over the last six years is that we can’t just focus on technology – we have to partner along the supply chain to create a business model that ultimately delivers commercial success for growers and retailers. “One of the major challenges for CEA is to optimise operations to bring down the cost of production to match existing imported products. Our prototype urban farm showed that it was possible to use CEA commercially, and we were able to demonstrate the demand for the produce we could grow. This ranged from specialist micro-greens and cut herbs through to mixed baby leaf salad. There are also technology challenges to be addressed when trying to meet the highly variable consumer demand for high quality, fresh produce. G’s Fresh supply baby leaf crops all year round, with much of the winter supply grown in Spain and Italy to ensure security of delivery. In summertime it produces a huge amount of outdoor salad crop, particularly lettuces and celery in the UK. Ben Barnes is investigating how controlled environment agriculture can increase the long-term viability and profitability of both of those parts of the business. The organisation has a large standard greenhouse facility that is used to propagate seedlings for planting out into the field. It is running two projects: Smart Prop, which is looking at increasing the efficiency of the propagation facility to improve growth and make stronger plants so they transplant better back into the field. And Winter Grow, a pre-commercial trial, to see if it is feasible to produce baby leaf crops during the winter at an affordable price point. Ben explains: “I'm going to be talking at the Agri-Tech East event about the commercial journey, in terms of the go and no-go decision-making process and what the key things are that we need to learn in order to be able to make those kind of investment decisions. “One element of this is the development of ‘lighting recipes’ to enhance plant growth characteristics. We've got multi-spectrum LED lights, so we can turn up the different amounts of red, blue, green and white, and even far red light. These are fairly expensive, so once we have worked out what works best we can buy fixed spectrum lights, which are a tenth of the cost. “You think LEDs are very efficient, but they still generate a heck of a lot of heat when you’ve got them turned up to full. It is more about keeping the space cool, and the plants obviously are transpirating so we've got dehumidifiers in there sucking the moisture out of the air. Dr Belinda Clarke is director of Agri-Tech East, an independent membership organisation that is facilitating the growth of the agri-tech sector, comments that the commercial challenges need addressing along with the technical and agronomic aspects: “The promise of CEA is sustainable, intensive production but achieving that may require a different type of value chain. “It could be that supermarkets of the future allow you to pick your own fruit and baby leaf instore, or we may see large-scale distribution of veg boxes, with produce grown indoors in optimum conditions or perhaps traditional growers would have more flexibility to grow a greater range of produce all year around with less waste. 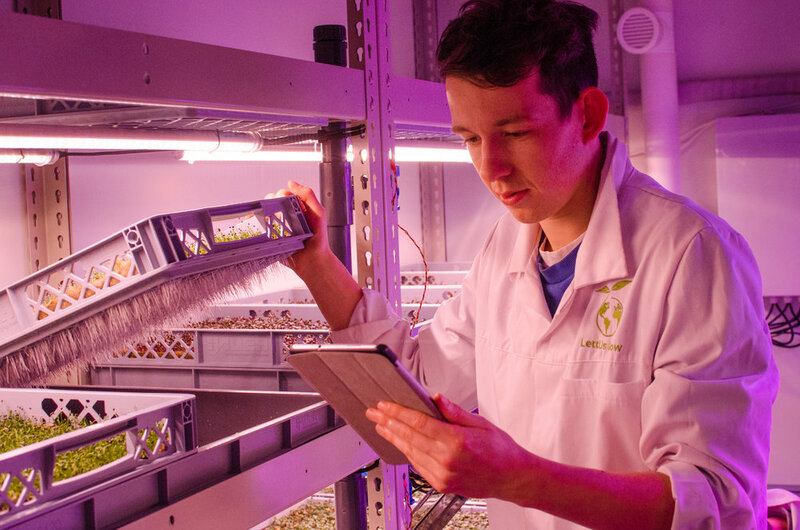 'Bringing the outside In – Innovating for Controlled Environment Agriculture' is taking place on 19 March from 10.00 – 16.00 at Rothamsted Research, Harpenden. It will look at the different growing systems, emerging technologies, the challenges of implementing a system and the logistics involved with integrating a controlled environment agriculture into the food value chain.